No other subwoofer offers Dynamo 500's bass extension, power, and detail at such an affordable price. Perfect for either home theater or stereo applications, the Dynamo 500 is solidly built with high-density materials to minimize cabinet resonance and provide a foundation for the high-output 10-inch woofer and high-current 120-watt RMS, 360-watt peak amplifier. 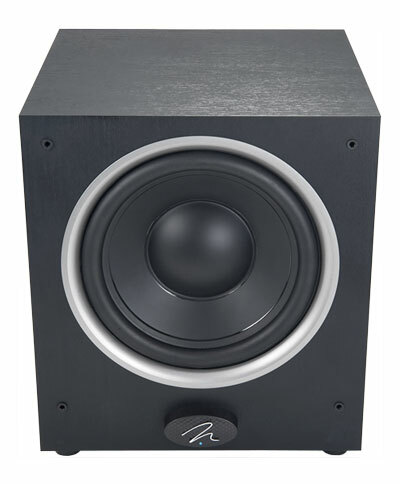 Additionally, dual rear-mounted low-turbulence ports maximize bass output while minimizing port induced distortions. Whether you are looking for high performance bass to enhance your music experience or take your home theater system to the next level, a new Dynamo family subwoofer should be at the top of your list. 10-Inch Low-Distortion Woofer Dynamo 500's high-resolution driver combines a 10-inch polypropylene cone with a high-intensity magnet structure to achieve huge excursion and output capability without sacrificing detail. By eliminating cone flexure, even at long voice-coil excursions, Dynamo 500's advanced-technology bass driver achieves the very low distortion necessary for proper blending with MartinLogan ATF (Advanced Thin Film) and electrostatic speakers. 120-watt (360-watt peak) Amplifier Dynamo 500's amplifier belongs to a recently-developed class of switch-mode designs that incorporate a variety of innovative techniques to reduce noise, distortion, and heat to the lowest possible levels. In particular, the switching frequency is much higher than in typical subwoofer amplifiers of this type, providing a tremendous true 120 watts continuously with extremely low distortion. Dual Low-Turbulence Ports Ports are a convenient and cost-effective way of increasing low-frequency output. Dynamo 500's dual low-turbulence ports are carefully designed to provide superb low-end efficiency while minimizing port induced distortion. High-Density Cabinet Construction Dynamo 500's high-density cabinet is carefully designed to minimize cabinet-induced resonances and provide an ideal baffle for linear operation of Dynamo 500's long-excursion 10-inch low-distortion woofer. Seamless System Integration: Engineered for Stereo and Home Theater Dynamo 500's connections and controls are designed to enable easy, seamless integration with any stereo music or multi-channel home theater system. Its main left and right line-level inputs feed into a precision low-pass filter with a cutoff frequency variable from 50 to 200 Hz. 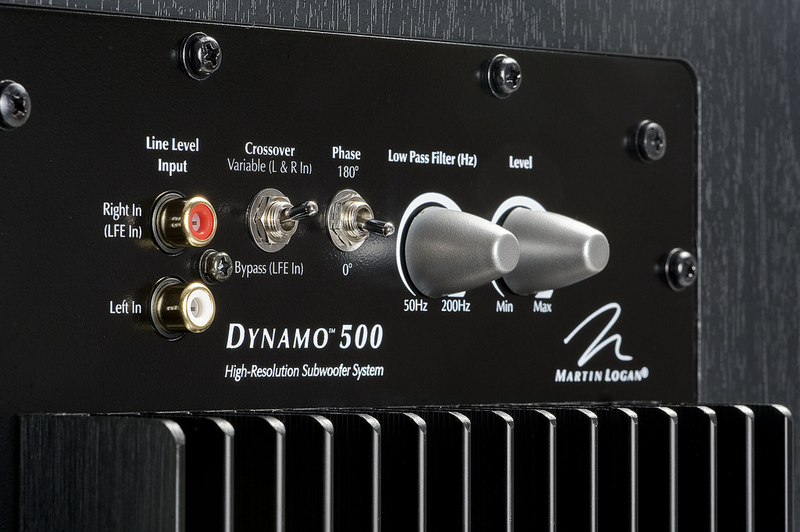 For systems in which a surround processor supplies the crossover, Dynamo 500 provides an LFE input low-pass filter switch that completely bypasses its internal filters. - Impedance Line level RCA: 20,000 Ohms. Compatible with 4, 6, or 8 Ohm rated amplifiers.